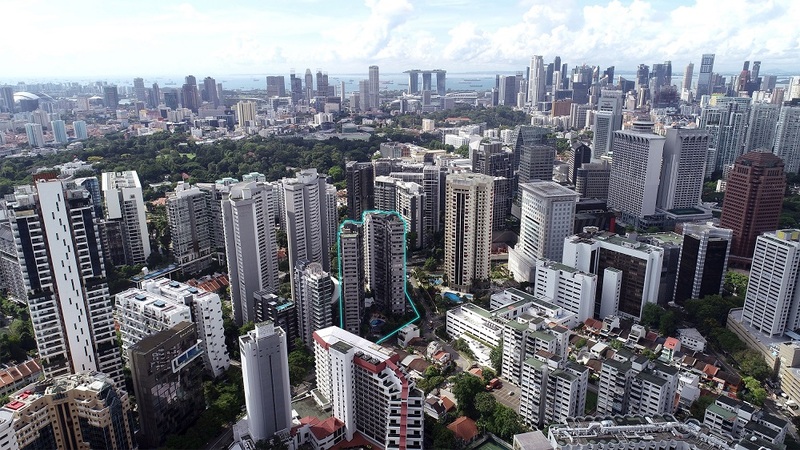 Knight Frank Singapore, the exclusive marketing agent representing the interests of the owners of Elizabeth Towers via their collective sale committee, is pleased to announce the launch of the sale of Elizabeth Towers, by tender. Elizabeth Towers, a prime freehold high-rise residential redevelopment site off Orchard Road, is a private residential estate comprising two residential blocks of 80 apartment and maisonette units, sized between 185 sq m to 417 sq m. The site is relatively regular with a site area of 5,046.3 sq m (approx. 54,318 sq ft), with dual access from Mount Elizabeth and Mount Elizabeth Link. The site is zoned “Residential” under the 2014 Master Plan, with redevelopment potential to reach a maximum height of 36 storeys, subject to authorities’ approval. Within the immediate vicinity are a plethora of retail malls, a premium hospital, hotels, landed homes and high-end condominiums, with Paragon Shopping Centre and Mount Elizabeth Hospital less than 200 metres’ walk from the development. International schools and established local schools are a close drive away, with Anglo-Chinese School (Junior) within 1 km from the development, and Anglo-Chinese School (Primary), Anglo-Chinese School (Barker Road), St. Joseph’s Institution Junior, St. Joseph’s Institution, Singapore Chinese Girls’ Primary and Secondary Schools, and St. Margaret’s Primary School located within 2 km from the site. Major arterial roads as well as expressways, such as the Central Expressway (CTE), Orchard Road and Cairnhill Road provide seamless connectivity to other parts of Singapore. Orchard MRT station is also a quick 6 minutes’ walk away. The reserve price for Elizabeth Towers is S$610 million. Based on its current as-built Gross Floor Area (GFA) of 23,452.286 sq m which has been verified by the authorities, this translates to a land rate of approximately S$2,416 psf ppr. With the inclusion of a 7% bonus balcony GFA, subject to authorities’ approval, and minimal development charge payable for the balcony area, the land rate is lowered to approximately S$2,297 psf ppr. “Elizabeth Towers is a rare, choice corner site for developers looking to build an iconic residential development in Singapore, and we believe it will attract strong interest from developers, given its positive site attributes. Couple with its superb location, we are also confident the end product will be in strong demand, especially from owner-occupiers,” says Mr Ian Loh, Executive Director and Head of Investment and Capital Markets at Knight Frank Singapore. The tender for Elizabeth Towers will close on Tuesday, 26 February 2019 at 3.00 pm.